Formerly known as The Greater Toronto Aboriginal Management Board (G.T.A.M.B), the name Miziwe Biik was given to us by Elder Jim Windigo. Our name is associated with the female water spirit and means water which flows all around us. Miziwe Biik is committed to assisting all persons of Aboriginal* ancestry to attain a better quality of life. We believe that community needs and aspirations are paramount. We are committed to strengthening the community through partnerships that promote equality and self-reliance. We will provide training and employment opportunities in a supportive environment in which people can affirm their Aboriginal*identities and develop to their fullest potential. We are committed to the belief that it is through traditional and cultural values, practices and resources that we will reclaim our destiny. 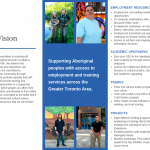 Our mission is to provide services to the Aboriginal* peoples in the Greater Toronto Area; to work with employers to secure employment opportunities; to deliver federal and provincial programs; and, promote Aboriginal* entrepreneurship and the development of our economies. We will work with individuals, other agencies and groups to provide these services and achieve our mission.